The SSC represents a consortium of 10 institutes in the ESA community, led by Prof Mike Watson from the Department of Physics and Astronomy at the University of Leicester. A full description of the role of the SSC is given in Watson et al. 2001. 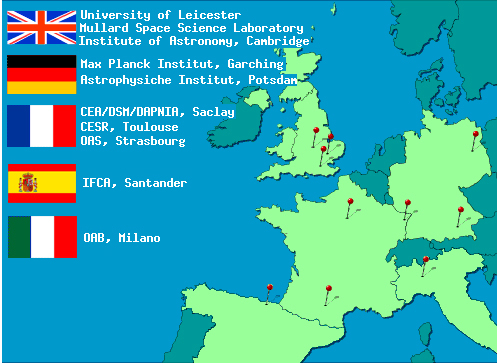 The SSC team includes investigators from ten institutions in five countries: France, Germany, Spain, Italy and the UK. With the loss of funding to support continued UK participation in XMM-Newton SSC activities, formal UK contributions to the SSC will essentially cease by the end of 2013, though continued UK input is envisaged at a substantailly reduced ('best efforts') level. In addition there are five Associate Scientists from Japan, China, the US and the UK. Points of contact (POCs) for the 10 SSC Consortium institutes, Survey Scientist, Project Manager and Associate Scientists.